Meridian Township held its bi-weekly Township Board meeting Oct. 17 at the Meridian Municipal Building. The meeting started off with an introduction to the township’s new administrative assistant to the Clerk’s Office and board meeting recording secretary Maggie Rodgers-Sanders. Rodgers-Sanders grew up around local government. Her mother worked in local government for 28 years as a trustee, treasurer and supervisor, and her brother is currently a treasurer for Lansing Township. Rodgers-Sanders says she expects to have a nice career in local government and wants to remain with the township until she retires. The meeting moved forward with reports and announcements from the board members and the township’s manager. Frank Walsh, the manager of Meridian Township talked about the quarterly meeting with Michigan State University’s President Lou Anna Kimsey Simon. Trustee Patricia Jackson and Supervisor Ronald Styka were also in attendance. “The the relationship remains very strong between the township and the University,” Walsh said. Meridian Township board members discussed issues involving the community during Tuesday night’s board meeting. upcoming election on Nov. 7. According to Dreyfus, citizens have been calling expressing their confusion with the Ingham County Ballot Proposal. The information provided by the county controller is also available at the Meridian Municipal Building to any resident who wants to know more about the Tax Limitation Proposal. 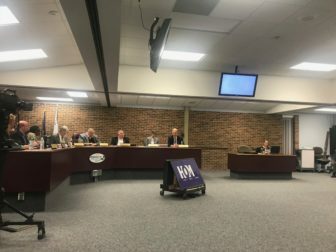 The township board also voted unanimously on all five action items on the meeting’s agenda. One of the action items included the Zoning Amendment #17030 to allow golf courses to be seen as open space for Planned Residential Development and Planned Unit Development. The board also passed the resolution to support White Cane Day. This resolution will allow Oct.15 of each year to be recognized as White Cane Safety Day and will acknowledge the blind residents in Meridian Township. To see the complete list of the action items on the agenda, here is the meeting agenda packet. The next township board meeting has been moved to Thursday, Nov. 9, at 6 p.m., instead of that Tuesday. The meeting is in the town hall room at the Meridian Municipal building and it can also be streamed at HOMTV.net.